It's that time of year - Springtime and Easter! 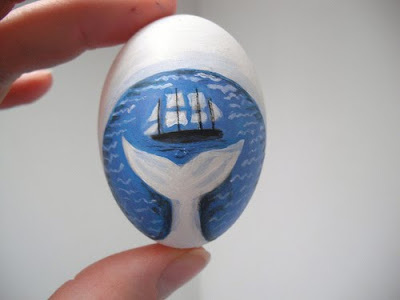 We've been collecting some fun ideas for decorating your Easter Eggs this year - hope you are inspired to try one. Links are in each description for your convenience that should lead you to the source and the instructions on how you can recreate these beauties. 1. Gorgeous Gems of the Sea from Coastal Living! Don't you just Love these coastal aqua and turquoise shades of blue? 2. Love love love the retro tropical-beach decoupage images! Way too cute, must see the whole blog for all of the directions and even printable images that you can use to create your own eggs. Hop on over to Melodrama Decor. 3. Nautical Bowl of Easter Eggs from The Mermaids Tale. Seriously, check her entire blog post - so darn creative! LOVE LOVE those little buoys and fish net covered eggs, not to mention the eggs sand dollar and sea urchin details. WOW - am a little envious of the imagination that went into these beauties! 10. Mermaid Netting Easter Eggs - super cute idea! Looks fairly easy to do with net and spray paint... Complete directions can be found at Everyday Shortcut Blog. Let us know if you try one of these 10 deas, or if you have a special "beachy" Easter tablescape or Easter Eggs that you'd like to share. Send pics of your diy Easter Eggs and we will share on our social media channels and there may be a special coupon code involved too! More Spring and Easter Ideas can be found on our Pinterest Page - Check it out!